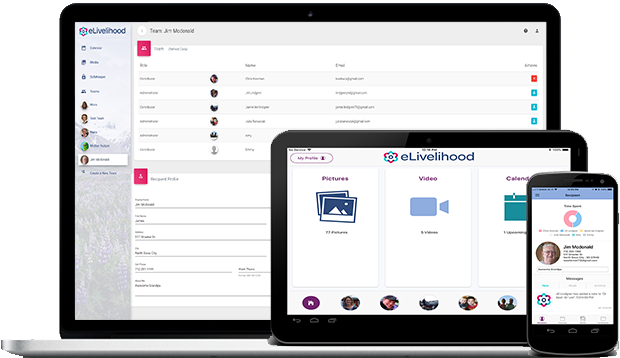 eLivelihood is the only online collaborative application that helps families manage the care and finances, and, monitor the health, of their aging parents. Our solution offers multiple service levels and you only pay for what you need, when you need it. We also keep your senior engaged with their own tablet application that keeps them informed and in touch with you. Keep your senior’s care in-sync with your family. Register your team today! Collectively put everything you need in one place. Assign and manage tasks between family members and track individual time spent on care. Securely store sensitive information like medication lists, insurance information, the Will, whatever is important to you. Automatically send wellness checks to the Senior tablet application and monitor acknowledgment. Get everyone on the same page with a shared calendar for managing events, tasks and appointments. Set individual permission settings so that only the members of the family that need access to secure information can do so. Invite 3rd party caregivers to the calendar, assign them tasks, track their time and keep a history of their notes on care activity. Reduce fraud and track contributions with a transparent view of the Senior's financial picture. Keep the cookie jar clear by loading existing bank accounts in a view only format to monitor finances. Transfer money to other authorized Team Members on the account securely. A customizable debit card with features to track charges, limit spending by location, category or amount. Each authorized Team Member can transfer funds to the Senior Debit Card via a secure transaction directly from their bank. Pay bills directly from the Senior Debit Card account for housing, utilities, repairs or just everyday expenses. Reduce fraud by monitoring transactions and limit exposure with the customizable Senior Debit Card. Monitoring basic vital signs, behavioral and activity changes alert the family to potential issues. Monitor heart rate, steps and sleep patterns. Track daily weight patterns to ensure health and wellness. Place motion and contact sensors to detect activity and movement. Use only the devices or sensors you need to give you piece of mind. We track the history and alert the family to any changes that could indicate a problem or concern. A tablet application tailored for the senior. Reduce Senior isolation by keeping them engaged and informed. Customize the level of involvement based on their cognitive needs and capabilities. 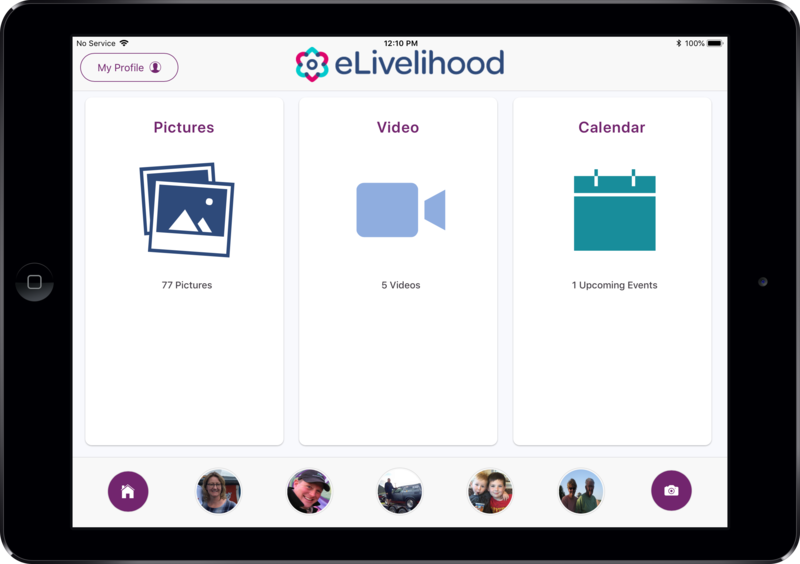 Instantly share picture and videos from extended family and friends directly to the tablet so the Senior stays connected to everyone. Allow the Senior to see calendar appointments to keep them involved in daily life planning. Allows the Senior to see their health statistics. Motivates them to 'get in their steps' or change sleep patterns for better rest. The app is specifically designed for Seniors to easily navigate, understand and operate. Automatically send medication reminders to the Senior tablet application and monitor acknowledgment. The Senior can contact anyone on their network with the tap of their avatar to send a text or email message. Pricing is per Team (with unlmited Team members) -- 30 DAY FREE TRIAL on all plans. No contract. No credit card upfront. Health IoT sensors and monitoring devices sold separately.